Some say that the kitchen in the heart of the home and a good looking kitchen certainly adds to the appeal of your home if you are trying to sell it as we discussed in our recent post; 7 Home improvements that will definitely add value to your property. Unfortunately, though, the kitchen is also one of the most expensive rooms in the home to refurbish. However, you can still give your kitchen a brilliant facelift and make it a room to be proud of, without having to go to all the expense of installing brand new appliances and cabinets. Here are ten simple tips on how to give your kitchen a face lift, and not break the bank doing it. You don’t have to go to the expense of buying all new kitchen cabinets; you can give them a new lease life in several ways. The first thing that you could consider is that you could just replace the worktops if they have become scratched and look worn. Worktops are usually quite easy to remove and replace and it will be a lot cheaper than buying a whole new fitted kitchen. You can also change the whole look of a kitchen by painting, or re-finishing the doors and drawers on kitchen units. The best paint colours for kitchens are usually white, off-white, or cream. If you wanted to keep the natural wood look, then you could sand down and stains, or re-varnish doors and drawers to bring the life back into the wood. Once you have spruced up the cabinet doors and drawers, you might want to think about some new handles and knobs for them. Take a trip to your local DIY store and you will find hundreds of different designs to choose from. You’ll be surprised at what a big difference that new fixtures for cabinets can make to the appearance of a kitchen. The quickest and cheapest way to freshen up the look of a kitchen is to repaint the walls and the ceiling. When choosing a colour for the walls, chose light, neutral colours. This will make the room look larger and you can hang pictures and fittings on the walls to add extra interest. Taps get constant use in the kitchen and can quickly become worn and tired looking. 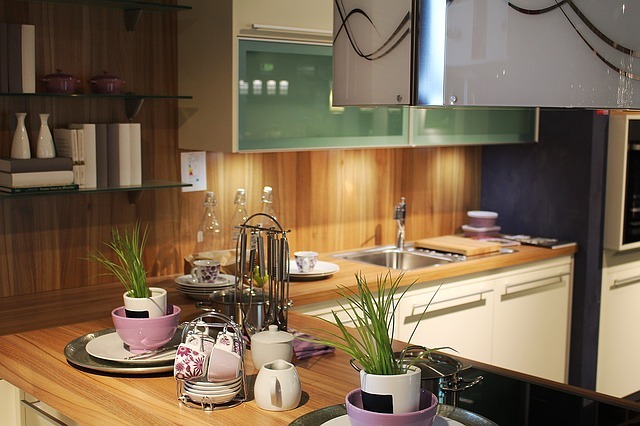 Update the look of your kitchen with some new ones and then you don’t have to buy a whole new sink. If you don’t want to do the plumbing work yourself, it won’t cost a fortune to hire a plumber for this relatively quick job. The floor of a kitchen is another area that can become worn and grubby. A change of flooring will make all the difference to the overall appearance of a kitchen and you have many options to choose from. The cheapest option would be to lay some new lino but, if your budget will allow, you could look at laminate flooring, or solid wood. While you are doing your budget kitchen facelift, don’t forget to change the light fittings too. It’s an easy job to do and, with so many different styles to choose from, you can add a whole new dimension to your kitchen and brighten it up too. Instead of re-painting cabinet doors, you could just take the doors off! If you remove the doors from wall mounted-mounted cabinets, take off the hinges and fill and repaint the woodwork, you can create open shelving space to display kitchen utensils and your best china. The real beauty of a kitchen facelift is that you get to choose how much you do and, when you do it. You can update your kitchen and give it a whole new look, at a fraction of the cost of buying a brand new fitted kitchen.